It is a great feeling to complete a conversion. I often cannot wait to hand it back to the client and get them started in Xero. However, it is really good to run a final check that makes sure that the conversion is really 100% as it was in the old system. It does not matter whether you did the conversion yourself or got one of the conversion services to do it for you, this check uncovers problems easily and quickly and minimises the risk that your client comes back to you later saying something was wrong. At Jet Convert we find a fresh pair of eyes picks up issues more readily and always have a different person running these checks, not the one who worked on the conversion. This might seem a silly step, but it is absolutely essential. Without this all your figures might be out. Just go to Settings – General Settings – Conversion Balances and press Save. 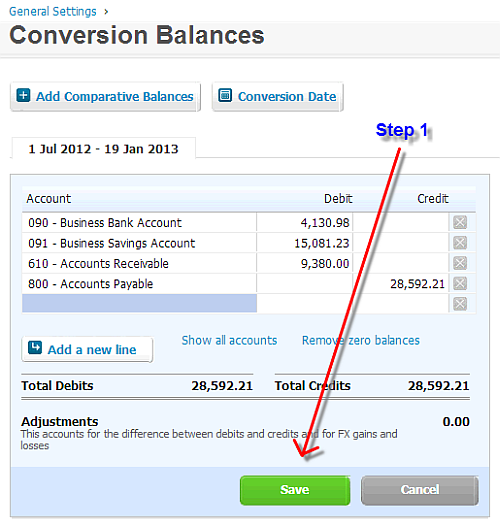 If anything has been entered or changed with a date that is prior to the conversion date, and after the conversion balances have been saved, your figures for that account will be wrong until the conversion balances are saved again. There is no warning of this happening and it is hard to find. Xero has a full explanation in the accounting behind Xero. So to be on the safe side, save the conversion balances. The second reason is that this will make sure the Accounts Receivable and Accounts Payable actually match the invoices and bills. If you can save the conversion balances that means they do match. If they do not, Xero will not allow you to save the balances and you know there is something wrong. Once you are clear that the Debtors and Creditors totals are correct (through the conversion balances saving without a warning), it is time to look at the details. Choose any month after the conversion date. It is often worthwhile checking off each individual clients’ total. If your source is MYOB, the corresponding report to look at is the Reconciliation Summary (or Reconciliation Detail if you are looking at invoice level) in the Sales tab for reports. You might come across Out of Balance invoices or Credit Notes which are entered if the invoices entered in the source system did not match the Accounts Receivable account. I’ll write about how to deal with them in a different post. They are actually ok to find in here. An exact replica of the process above for the Ages Payables report. The quickest check is comparing Equity in the balance sheet and Net Profit in the Profit & Loss report. Both should match. We actually compare every single account in the trial balance to make sure nothing has shifted (and we do it on different dates). Please note that the totals of a trial balance will never match when comparing to MYOB. 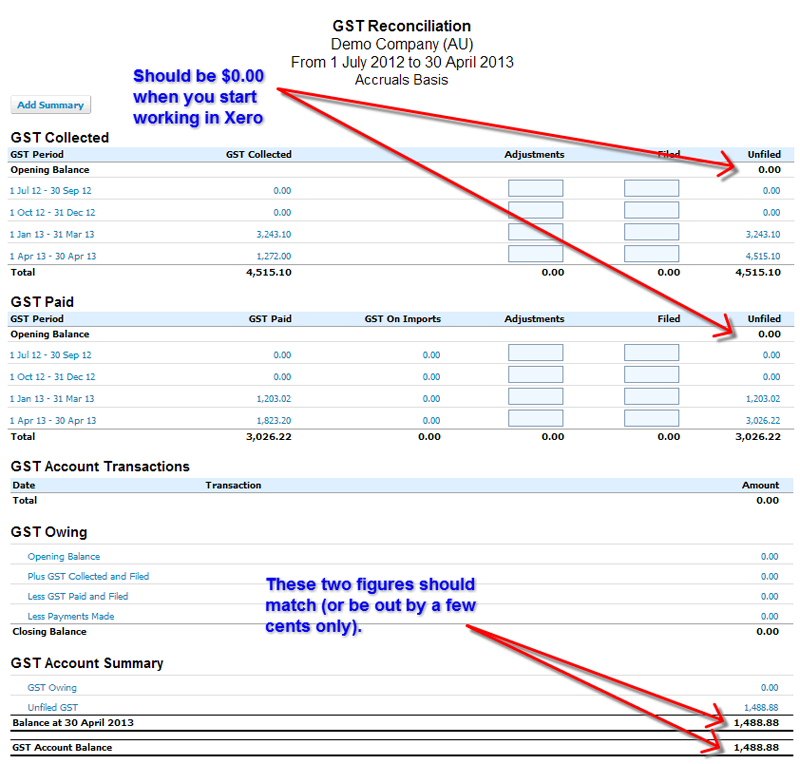 The reason is the single GST in Xero, compared to multiple GST accounts in MYOB. So these totals are not a place to use for checking. The Statement Balance on the Dashboard should be the same as calculated in the source system for the accounts that are reconciled. 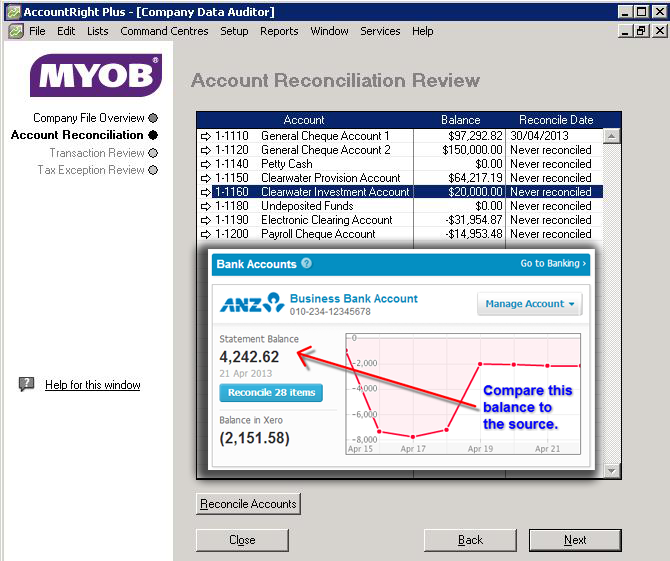 We use the Company Data Auditor in MYOB to see which account has been reconciled and to which date. Unfortunately, the Balance on this window is not the one we are after. 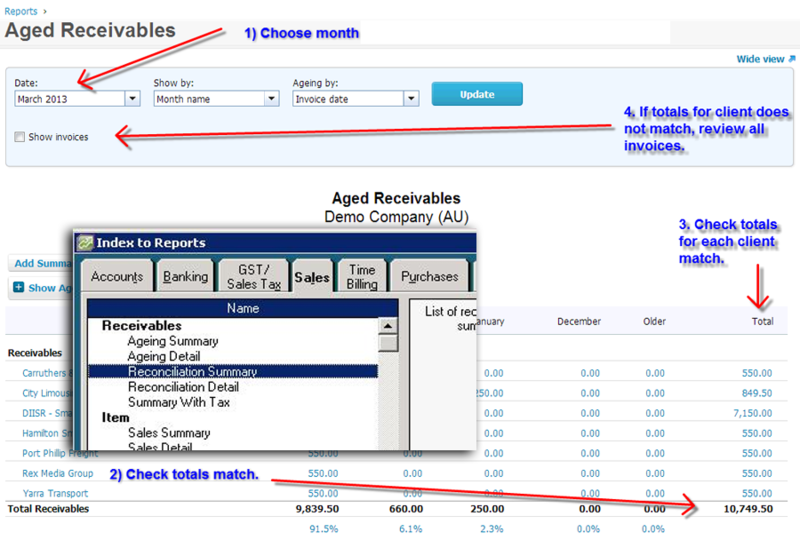 You need to click the Reconcile Accounts button and view the Calculated Statement Balance. That should be the same as on the Xero Dashboard. The GST Reconciliation Report is really useful if set up correctly. The difficulty is that any open invoices from before the conversion date might impact on it in a way they should not. When the conversion is completed successfully, it should show $0.00 for the Unfiled Amounts in both GST Collected and GST Paid. The two bottom figures should also match (unless the difference is a couple of cents). That means you are ready to run the report and get the most out of it. You will still need to publish any Business Activity Statements from after the conversion date, but that belongs in the post conversion tasks. Once all of these things are done, it is important to protect your work and minimise the risk that any client messes with it. The simplest way is by entering the Period Lock Date and End of Year Lock Date. For the Period Lock Date, choose a date as close to today as possible, but leaving the dates open that have not yet been reconciled. The End of Year Lock Date is best chosen as the day before the conversion date. This protects the conversion balances from being changed by accident. If you are certain that you do not need to make any other adjustments, you can also choose a later date to protect from accidental changes you might make yourself. We are really keen to hear about any other checks that you find useful. Please share below.